By Ashutosh KS in Mobile. Updated on April 9, 2018 . If you have heard about CyanogenMod but aren’t really sure what it is, then this is the post you should be checking out. To start off, CyanogenMod may feel different from an Android but is essentially built on Android. Sometimes known as CM, it has a cleaner interface, reeks of innovation, and is a free and open source aftermarket firmware for smartphones based on the Android platform. The word ‘CyanogenMod’ is formed from two words – ‘Cyanogen’, after its creator Steve Kondik who is also known as Cyanogen; and ‘Mod’, which means to modify. Hence the word ‘CyanogenMod’ means the modified firmware (of Android) developed by the Cyanogen (Steve Kondik). CyanogenMod is built upon the source code of the open source release of Google’s Android, which is also known as Android Open Source Project or AOSP for short. Its development started back in 2009 in a quest to make a modified Android which can be installed on rooted devices, and provide users with better or extra features, which are not found in the original or stock versions of Android. It soon grew in popularity and a small group of developers, called the ‘CyanogenMod Team’, started pushing code contributions. CyanogenMod is the most popular custom ROM for Android devices, available for 350+ devices combining both of its official and unofficial ports. It is one of the oldest firmwares for Android, still in active development. So What makes CyanogenMod so special? 1. It is the base for many other custom ROMs such as CarbonRom, PAC ROM, etc. 2. It comes with numerous built-in features which are not found in Google’s version of Android or in stock versions created by various mobile phone manufacturers and carriers. 3. Also absent are the unnecessary bloatware you are stuck with in stock versions. 4. CyanogenMod’s ultimate feature is its lightweight code which accounts for the stable and fast operating system. 5. It comes with built-in root access for getting super-user privileges in the system. This also means that you can remove any system app if you find it of zero use. 6. It also comes with various customization and privacy features which helps you to better manage and use your mobile device (more on that below). CyanogenMod is one of the more customizable Android firmware’s available on the market. Its theme engine lets you modify the look and feel of the entire operating system, and it works completely as you want as you can change either individual items or none or all of them. 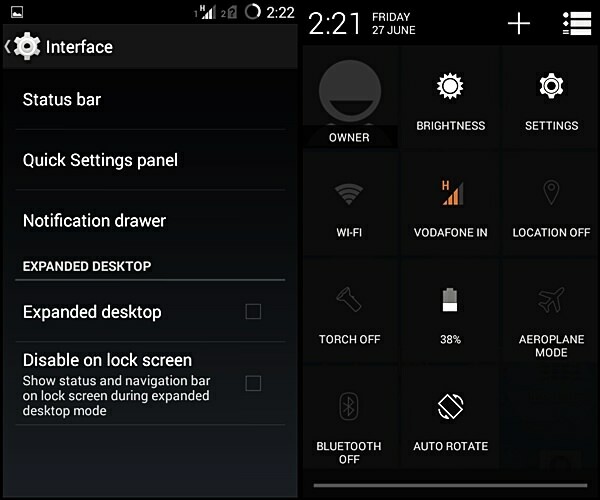 Some of CyanogenMod’s best customization features are Navbar and Button configurations, Themes, Profiles, Status Bar and Quick Settings configuration. Profiles lets you control and change sound, connectivity and additional options as per the time and environment. There are many, easy-to-use and easy-to-modify configuration options for many other visual elements like navigation bar, hardware buttons, status bar, quick settings tiles, etc. CyanogenMod, being “open” and supported by a certain community, is concerned about your privacy and takes the extra step of providing you with the right tools to better manage and control it. 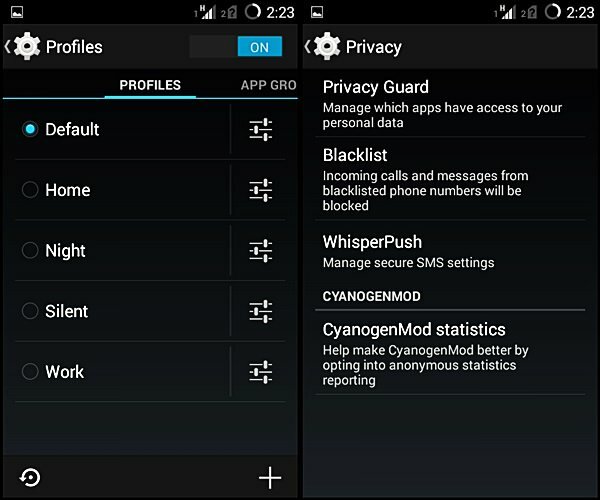 CyanogenMod also comes with great privacy features such as Privacy Guard, Global Blacklist and CM Account. Privacy Guard lets you control which applications can get information about you and your contacts. Global Blacklist, which is integrated into the operating system itself, lets you block messages and calls from unwanted contacts. CM Account offers you a secure and encrypted account which can be used to find and wipe your device remotely. An “Open source operating system”? 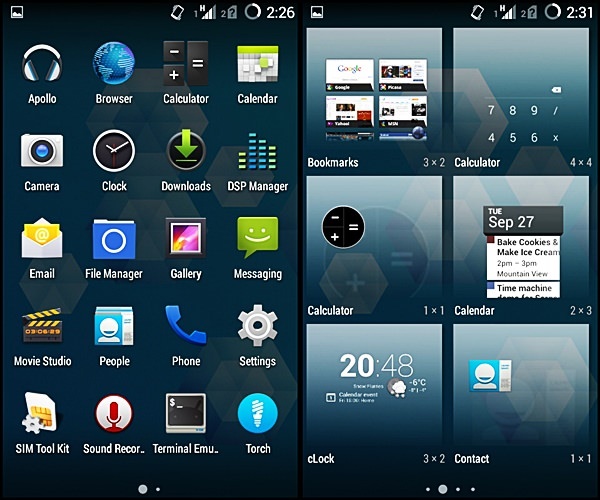 CyanogenMod is a free and open source software. This means its source code is freely available to any person, and this offers you the freedom to personalize it according to your own needs – it’s not about just changing the design or the theme, but anyone can take this software and modify it entirely. This also provides you the power to view the source code and catch any bugs or loopholes or backdoors in the software. Being an open source software, it’s developed not only by the official CyanogenMod team but also by the large open source community of enthusiasts and developers who love this software. Anyone – even you – can push a bug-fix or a feature update, which can then be added to CyanogenMod after getting verified and tested by the official team. This also means there are more developers to catch and fix bugs as well. CyanogenMod is built over Android. CyanogenMod is only a different flavor or version of Google’s smartphone operating system. It’s like making the same dish using different recipes – this gives you various choices and you may end up favoring one recipe over another. That’s the same situation as with CyanogenMod, vanilla Android (AOSP) and various other ROMs. This is the result of Android being an open source operating system. The open source Apache license lets anyone release his/her own flavor or version. This is the case with CyanogenMod – it’s essentially Android but wrapped up in a whole new package with simple looks and better features. People like to make choices, and that’s why CyanogenMod was developed. To provide Android users with a new, better and community-driven choice. Is CyanogenMod The better choice? CyanogenMod provides you with extra and better features which don’t cost you a dime. Stock ROMs which come built-in with Android phones are mostly large in size, have heavy user interface and lots of bloatware, eat lots of memory; and thus provide a bad end-user experience such as constant lags and slow responses. CyanogenMod helps eliminate all those redundancies and provides a better, more fluid and ever-responsive experience. Moreover, apps crash less and it offers better features. Maybe your phone’s manufacturer or carrier have stopped providing updates for your phone but you wish to use the updated or latest version of Android? The good news is that you can still try the latest Android on your old or legacy smartphone by installing CyanogenMod. There are other reasons too – it is an Android firmware with built-in root access, advance performance features and useful developer options. Moreover, you can customize the complete look and feel of the operating system and make it your very own using its theme engine. How does CyanogenMod improve My end-user experience? CyanogenMod delivers an experience very near to Android. Its experience is much closer to the vanilla Android (AOSP) experience – the experience that is created by the search giant for its mobile operating system – with the addition of some tweaks and features to make it better and more responsive. Its lightweight code provide a fast and lag-free experience while browsing the apps and widgets. No bloatware accounts for zero unnecessary apps and services, and thus you get more memory for running your own apps and games. Moreover, it also saves you from wastage of unnecessary resources like mobile data and battery. The theme engine lets you customize things like sounds, fonts, icons, boot animations, etc. And you can choose specifically what to modify. This allows you to change the look of each element using a different theme. Does It Come With advanced options? 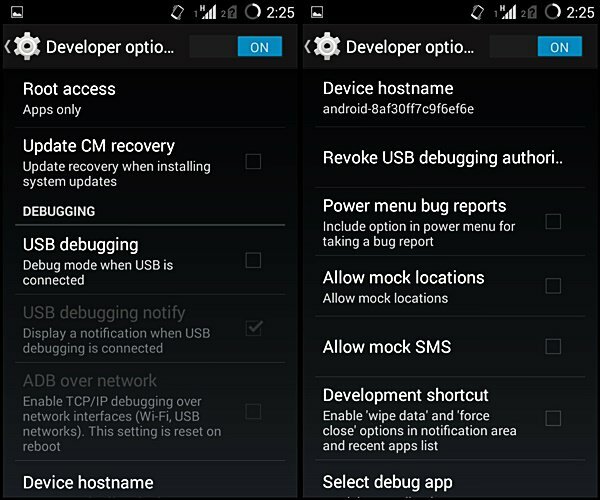 CyanogenMod comes with many advanced options for power users and developers. First of all, it comes with built-in root access. This allows you to gain privileged access in your device and do administrative tasks such as uninstalling system apps, editing system configuration, browsing root file system with write permissions, etc. Superuser – another built-in feature gives you the power to control which of your installed applications can gain root privileges and to check logs. 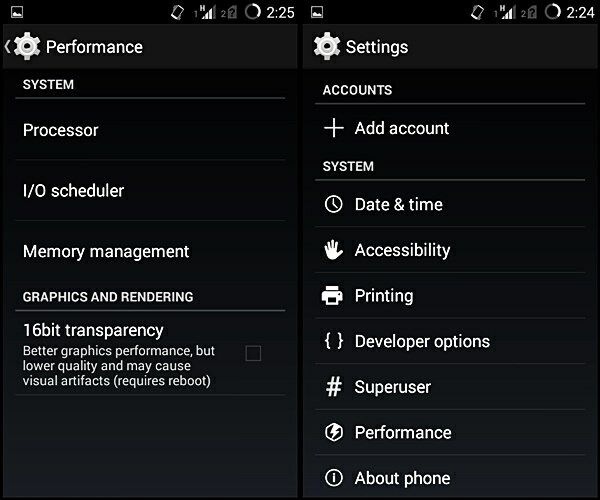 Performance options allows you to modify settings related to your device’s performance and battery life such as processor speed, input/output scheduler, graphics and memory management options, etc. Developer options – a section especially for developers – also adds some extra features, such as ‘Root access‘ option lets you permit root access for apps, adb or both. ‘Device hostname‘ option lets you change the hostname of your device; ‘Kill app back button‘ option lets you kill apps by long-pressing the back button; and many more. CyanogenMod is the most downloaded custom firmware on this planet with more than 10 million downloads. This number does not include many more who don’t opt-in to report the statistics. It’s distributed officially for 225+ devices and additional 125+ devices get this ROM in the form of unofficial ports by enthusiastic developers. Cyanogen Inc. – the company behind CM – has brought this ROM to new heights. Its efforts combined with the work of CM Community have made CyanogenMod as the first custom ROM to become the officially-released firmware for a smartphone. 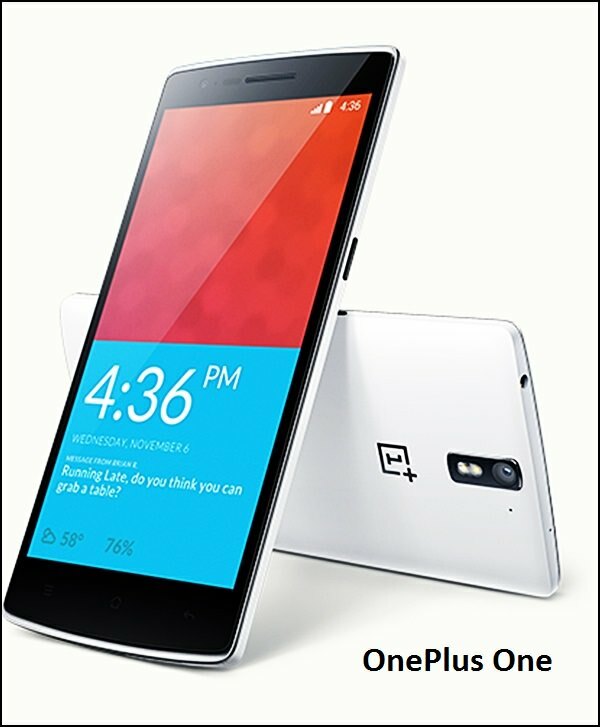 Oppo N1 is the first phone to officially come with CyanogenMod pre-installed; and OnePlus One is the second phone to do the same. Should I switch To CyanogenMod? Why not? Actually yes, but it’s your choice. You have got options and you can consider anyone of them – maybe your stock ROM, or CyanogenMod or any other custom ROM. It all depends on your choice and preferences. If you’re unhappy with your current stock or custom ROM, or are looking for a better and simpler ROM, or want to try a new ROM, then simply switch to CyanogenMod. What’s your selection? Are you going to switch to CyanogenMod? Let us know via comments.